Scotts® EZ Seed® Patch & Repair Centipede Grass is an three-in-one patching product to help fix bare spots in the lawn. It has the combined power of seed, mulch, and fertilizer to help it grow even in tough conditions. Guaranteed* success with 3 simple steps - prep, apply, and water as directed. 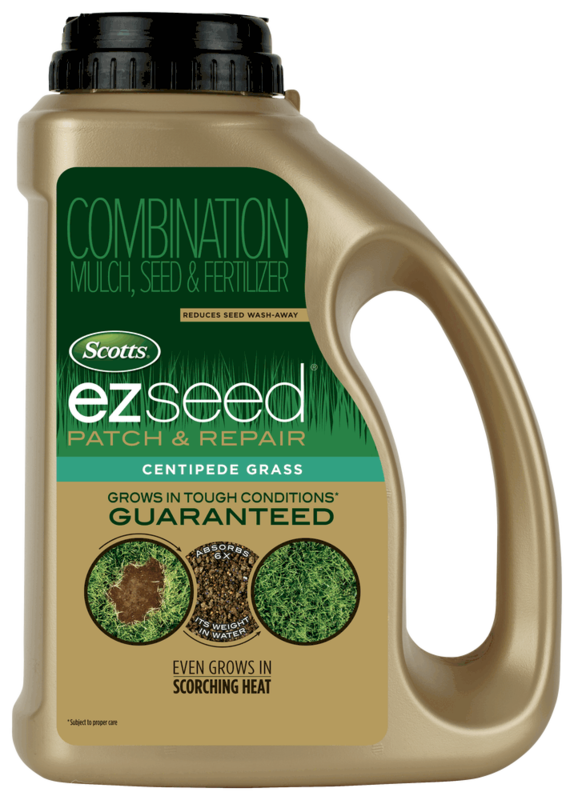 Scotts® EZ Seed® Patch & Repair Centipede Grass is made especially for tough Southern conditions and can grow even in scorching heat and acidic soil. *Subject to proper care. 3.5 lb. jug covers up to 85 sq. ft.; 10 lb. bag covers up to 225 sq. ft.; 20 lb. bag covers up to 445 sq. ft.
For use on bare spots or patches within your centipede grass lawn. 2. APPLY - Evenly apply EZ Seed® so the area is mostly covered, but bare ground is still visible. (Use half as much for thin areas). Only apply the recommended amount so that seedlings have enough space to access water and nutrients. 3. WATER - A deep and thorough initial watering is the key to success. Gently water the area until EZ Seed® is completely saturated and no more water is being absorbed (this may take several minutes). Continue to water daily or as needed to keep the soil surface moist until the seedlings reach at least 2 inches tall. Spring and early summer are the best times to plant EZ Seed® because the seed germinates best when daytime temperatures are between 70 degrees F and 90 degrees F and all danger of frost has passed. A deep and thorough initial watering is the key to success. Gently water the area until EZ Seed® is completely saturated and no more water is being absorbed (this may take several minutes). Continue to water daily or as needed to keep the soil surface moist until the seedlings reach at least 2 inches tall. It is safe to mow the seedlings once they reach at least 2 inches in height. Centipede grass can be slow to establish but provides a low-maintenance grass that's tolerant of sandy soils, and thrives in full sun and partial shade. It requires less mowing and feeding than other warm season grass types. Do not apply a weed control product until after at least four mowings. The seed is treated with Apron XL® fungicide (mefenoxam). Thrives in sunny areas and sandy, acidic soils. Grows a low maintenance lawn. 99.9% weed free.